Our products were recently featured in the national home improvement magazine Extreme How-To! We're proud to have our products featured in the April 2009 edition of a leading home improvement magazine, Extreme How-To. Extreme How To is the magazine for the serious home project engineer. Extreme How To Offers products, plans, and tips for today's most popular extreme duty projects and diy - do it yourself projects, home improvement and home decorating. 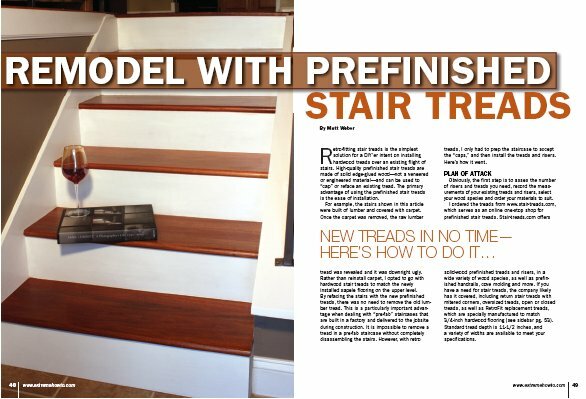 In this article, the editors walk through a typical installation of our stair treads with great pictures and explanations of each step in the installation process. We've posted the entire article on our website where you can read and print a copy.